I first heard about Sean Michaels’ novel from Tanya at 52 Books or Bust earlier this year. She’d read the Canadian edition and was raving about it, hoping to convert North Americans south of the border. Picking up the link for her review I checked my own comment which begins ’Sold!’ I hope that some of you will have the same reaction but if neither Tanya nor I can persuade you perhaps the judges of the Giller Prize – Canada’s equivalent of the Man Booker – can: they made it last year’s winner. It’s about, Leon Theremin, a Russian inventor born in 1896, and if that name seems familiar you may have come across the musical instrument he devised. Once heard its strange haunting sound is hard to forget. Leon is a bright child with a keen ear for music, always devising strange contraptions. He wins a place at Leningrad’s Physico-Technical Institute where he invents an electrical musical instrument for which the player’s body acts as the device’s conductor. Notes are produced by waving an arm in front of its antenna. Leon’s invention goes down a storm, catching the attention of Lenin, no less, who sees an opportunity. Leon is packed off to the United States where he acquires a handler in the form of Pash who wheels, deals and finesses their way around the rapturous audiences attending Leon’s concerts. Rubbing shoulders with the likes of Glen Miller and George Gershwin, Leon makes a splash in American society where he meets his beloved Clara. The years roll by: Leon continues to enjoy the theremin’s success, inventing new devices to catch Americans’ attention; Pash disappears when the Crash of ’29 hits but Leon’s adoring coterie rescues him. When the two Karls appear, Leon must spill what few beans he has every fortnight in order to stay in the US. Life becomes murkier and murkier, taxes accrue as do debts – it eventually becomes clear that returning to the motherland is the only option but things are not as they were: Lenin is dead and Stalin is in power. Leon finds himself convicted of spying, shipped off to a gulag until his inventive mind finds a way out albeit into another kind of imprisonment. Throughout it all, he remains hopelessly in love with Clara to whom the book is addressed in the form of two letters: the first written in the locked cabin of the ship taking him back to Russia tells the story of his American adventures; the second is about the gulag, written from his ‘scientists’ prison’ in the midst of the most secret of missions. 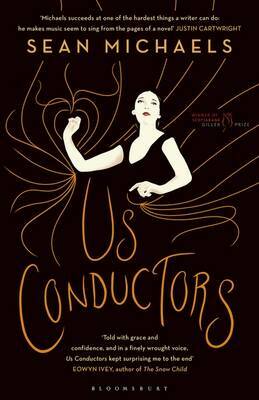 The bare bones of Us, Conductors are based on Leon Theremin’s life but as Michaels is careful to point out at the very beginning ‘This book is mostly inventions’, a nice little pun on Leon’s activities which gives you a flavour of Michaels’ writing. Those inventions are spun out into an absorbing story, beautifully told. Michaels has an eye for the succinct yet striking phrase – Leon is ‘baffled by comfort’ when the depravity of the gulag is swapped for what feels like house arrest, Pash’s eyes have ‘the glint of safety deposit boxes’ when making his many deals. The American chapters are as vividly exciting as the gulag sections are gut-churning. Leon is a cleverly drawn character, disarming in his naïveté yet entirely believable. It also has one of the best lines I’ve come across in fiction for some time: ‘I had never been so hopeful as when Lenin played the theremin’ Beat that! Many thanks to Tanya for alerting me to Us, Conductors, and if you want to hear the theremin pop over to YouTube where you’ll find a demonstration by its inventor. This entry was posted in Reviews and tagged Bloomsbury Books, Canadian Fiction, Leon Theremin, Music, Russia, Scotiabank Giller Prize 2014, Sean Michaels, theremin, twentieth century, United States on 17 July 2015 by Susan Osborne.